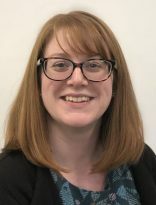 As a Speech and Language Therapist, my passion for supporting people to communicate socially, share opinions and maintain independence, is at the heart of my work at the Ace Centre. I have previously worked with adults with acquired communication and swallowing difficulties in hospital and community settings. My particular interest is in working with adults with complex language difficulties and aphasia. I am proud to be a part of the Ace Centre Team and enjoy working with a wide range of children and adults as part of my role. I am enthusiastic to continue to develop my knowledge and skills in the field of Assistive Technology and Communication Devices.